Back in the 1950’s, as winter turned to spring in Maine our springtime ice skating playground changed from ice to water providing more opportunity for outdoor activity. Watching Mother Nature come alive was, and still is, awesome in its wonder and diversity. Imagine the swampy pond featured in this photograph as ice, and the winding trails for playing tag on skates from November to early March. As the ice and snow melted away, cattails, polywogs,and muck up to your knees was cheap entertainment for me and many of my friends. 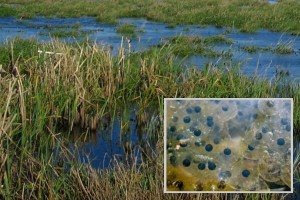 Finding large clumps of frog eggs, and then returning often over time to watch as they hatched to polywogs, grew limbs, and eventually lost their tails turning into frogs was a marvel for young eyes. Plants, birds, insects, and other critters provided an education and appreciation for nature you just can’t find with a joystick or xBox.